A guide for teens with struggling mental health. 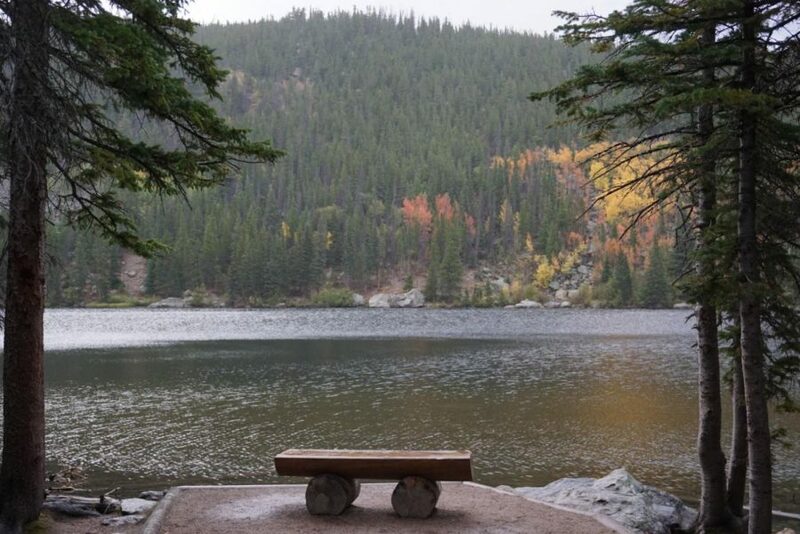 A bench in Colorado sitting on the Bear Lake trail. Colorado helped me cope with how I was feeling. I am the last person that should be talking about how to prevent your mental health from taking a plummet. The difference is that I went through some of the darkest mindsets of my life. I conquered it, but it has been hard to get back on track with my school work, extracurriculars and overall keep my life together. However, this is the part you need to get better, the transition. Changes are something I have a serious problem with, which is how my mental health downfall actually began. Changes can be scary and nerve wracking but, other times, they can change you for the better. My whole life, I have been scared of what is to come. I held back from risky situations and kept my emotions and words hidden until one day, I fell apart. I do not recommend holding in everything until you shatter into a thousand pieces, but I do know that is how some people are, just like me. Sometimes, it seems better to just hold it in rather than trying to explain it to someone who will never understand what you are truly feeling because you can’t find the right words to explain it. I always told myself no one will ever understand. Most of the time, I was right. My friends would create solutions that made no sense, my family just tried to make me happy, but the biggest problem stayed with me: I was lying to myself. Maybe they can not understand because I do not understand it myself. I’ve never been the best at explaining things in person, so that’s where my love for art came in. Photography, films, journaling, painting… I did it all. Step #1: Clear your mind. When I came to the realization that I did not fully understand what was going on in my life, I decided that I needed to write it down. I wrote down everything: what I stressed about, what I worried about, my confusing thoughts, people that who made my life worse, people who made my life better… the list continues. I continued this until I could recite it when I got upset. I did this so I could see the problems in my life on paper rather stuck in the mess that is my head. This also allowed the people around me to be able to help me. I saw my mind on a piece of paper, which allowed my thoughts to flow. I fully understood what I was going through. I felt a sense of relief, my problems were no longer jumbled in my head. At this point, the fear that I have lived all my life was necessary and inevitable: change. After I could identify what I experienced, I could find solutions for myself and try to get my life back together. After searching for solutions, everyone’s pathways are different. You decide solutions which could be anything from dropping an activity, getting help in a class, or even saying goodbye to a toxic person in your life. To help cope with the change that may terrify you, it is important to channel yourself into something new. Step #2: Create a distraction. Forms of mental health issues do not disappear in a blink of an eye. It takes time, effort and distractions. Create a distraction for yourself. I do not mean sit on the couch and eat chips, I mean, find something. Seek out a passion or something you have always wanted to do. When I was going through the roughest time of my short 18 years, I remember telling my mom I needed a break. A break from this town, with the same people, with the same problems I face everyday. I just wanted to leave everything behind even if it was just for a day. So, I went to Colorado. A lot of people were confused when I told them I wanted to go to Colorado. “Why would you want to go there?” they would ask. The answer is simple: I love nature. I wanted to feel free and escape from what I was faced by hiking in some of the most beautiful scenes around the world. Colorado was where I needed to be. Hiking helped distract me from all the things that were going on at home. It allowed my body to climb over my problems so my mind didn’t have to. I felt happier and more alive. A picture from my trip to Colorado. This is where I discovered peace and serenity. The point of this is you need to find a passion. Maybe it’s hiking, painting, or even cooking. One thing I can take away from my horrible mental health downfall was that I found a passion for hiking. If it was not for the downfall, I might have never found it. Finding a passion and turning it into a distraction can absolutely change your view of life. It definitely did for me. This might sound completely impossible for some people, but trust me, give something a chance. Let something creative or something worth caring for take over your mind instead of the depression, stress and anxiety and more. Step #3: Take your life back. This is the most difficult because it requires you to change yourself and mindset. Now, I am not saying go change your hair color or buy expensive clothing, unless, of course, that is your passion. I am saying to take small steps to slowly get rid of the problems from your life. I can give you a small scenario, one of my thousands of problems was that I could not get things done at home. I was always tired and sad, so I would usually just go straight to bed. To change this and try to make my life a little simpler, I got a whiteboard. This is the whiteboard I write on to complete tasks. I have used this board to check off when I complete things to ease my mind. For me, the pleasure of finishing a task and being able to erase it encouraged me to get things done. This actually began to work and I started to turn things in left and right. I put simple things on the whiteboard like “clean my room” or “wash laundry”. I went as far as avoiding huge tasks. I waited until I got the gist of it and then, I started using it on an everyday basis. This very small process of bringing a whiteboard home completely changed my wellbeing in a place I should be comfortable. Before doing small things to change my mindset, I felt useless and felt like I was never going to be good enough ever again. Trust me, this is the longest step there is. I am still in the process of it and still changing small things about my life everyday. This should be the step where you learn who you are and what you can do, the good step. Some things will work, some will not. This is the step where you make mistakes and learn from them until you figure out a plan that will make your life the easiest. Mindsets are difficult to change. Mental health is hard to fix. Only you know what you feel, only you know what you can do. Do not beat yourself up over one mistake, do not hold it in like I tried to. You are worth it. You are more than you think you are. Being your own biggest critic is hard, but there is a bright future for you. Be strong and hold on. A girl with a struggling mental health and a person just like you. If you ever feel on the verge of giving up… do not. Breathe, you have got this. Your life matters. This story was originally published on Hoof Print on March 20, 2019.